You can add a backup repository as an extent to the scale-out backup repository at any time. For example, the scale-out backup repository may run low on space, and you will need to add storage capacity to it. In the inventory pane, click Scale-out Repositories. In the working area, select the scale-out repository and click Edit Scale-out Repository on the ribbon or right-click the backup repository and select Properties. Move to the Performance tier step of the wizard. In the Extents window, select a check box next to the backup repository that you want to add as an extent to the scale-out backup repository. 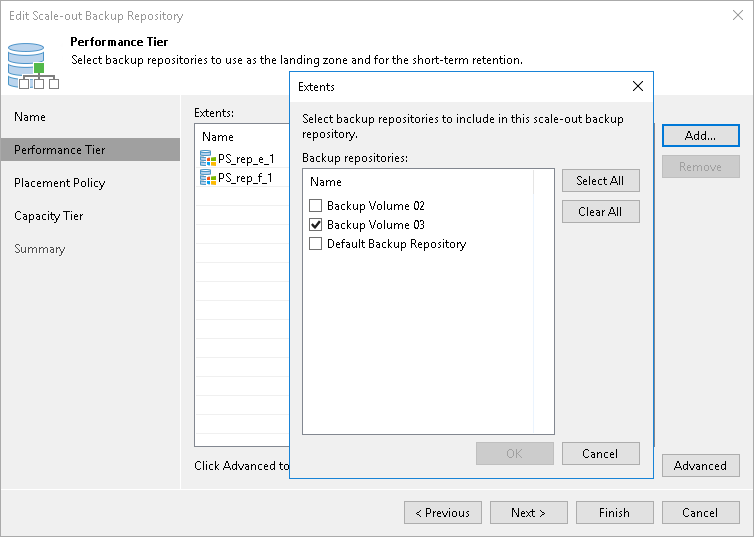 If a backup repository that you add as an extent is already used by jobs of supported type or there are backups pointing at the backup repository (for example, independent backups created with VeeamZIP), Veeam Backup & Replication will offer you to update a link to the backup repository in the job properties. Click Yes to update the link and target the jobs and backups at the scale-out backup repository. If you click No, you will not be able to pass to the next steps of the wizard. Pass through the next wizard steps and finish working with the wizard. The new extent will be added to the scale-out backup repository. After you add a backup repository as an extent to the scale-out backup repository, you will not be able to use this backup repository as a backup repository. To use such backup repository as simple, you will have to remove it from the scale-out backup repository.